In KBS 2TV sitcom “I Need a Fairy“, the sweet fireworks dating scene of fairy Hwang Woo Seul Hye and Lee Joon is attracting attention. On May 4th, 2012, MBLAQ member Lee Joon falls in love in first sight after seeing fairy Chae Hwa (played by Hwang Woo Seul Hye), and begins to court Chae Hwa. Under the night with sparkling stars, they stand on the rooftop to play fireworks, as if lively and lovely children, very eye-catching. 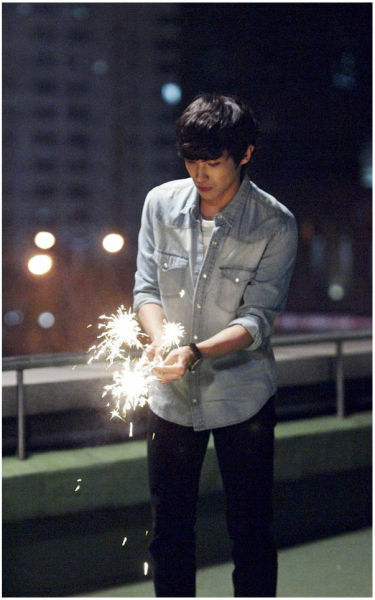 This the the romantic and sweet dating prepared by Lee Joon for Chae Hwa who loves flower. Especially Lee Joon who is strict to junior trainees, transforming into a romantic, gentle and considerate man after falling in love at first sight with Chae Hwa, seems to be very natural and unrestrained. On the other hand, after revealing that the first kiss of Ma Tae Hee (played by Yoon Ji Min) after drunk was with Se Dong (Lee Doo Il), they recall the kiss scene on the day whenever meet, in panic and stage funny and comical scenes, provoking laughter.